On a frigid Saturday morning on Nov. 5, I was watching some birds around the feeders when I noticed a dull flash of brownish feathers on the trunk of a cherry tree. I could have dismissed the glimpse as a wren or sparrow, but intuition convinced me to raise my binoculars. 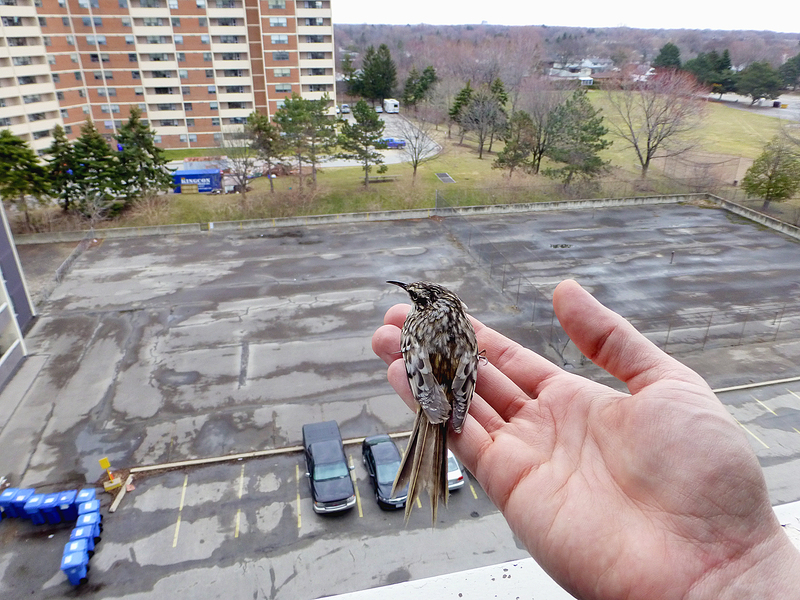 Photo by Rob Hicks Stunned after striking a window, a recovered brown creeper prepares to fly away from an apartment complex in Ontario, Canada. Once I focused my binoculars on the bird in question, I was delighted to welcome a long-absent bird back to my yard. The last time I’d observed a brown creeper in my yard had been in October of 2013. Over the years, brown creepers have been scarce birds at my home. In fact, I’ve seen very few brown creepers, either at home or while birding in other locations. Brown creepers are woodland birds and not usually found far from trees. This bird isn’t a particularly rare species, but its lifestyle and appearance go a long way toward explaining why this small, nondescript songbird is so good at flying under the radar even of practiced birders. A couple of years ago, Rob Hicks, a friend from Ontario, Canada, presented me with some photos of a bird he needed help identifying. The bird in the photos had collided with a pane of glass, possibly the door onto Rob’s balcony. Fortunately, the impact didn’t prove fatal and the bird, perhaps a little wiser, was able to fly away from the incident. The brown creeper is a widespread bird across the United States and Canada. Its nesting range extends from Alaska, Ontario and Newfoundland southward throughout western mountains, as well as the Great Lakes region, Southern Appalachians and New England. In Northeast Tennessee, this bird is considered uncommon. According to the book, “The Birds of Northeast Tennessee” by Rick Knight, the brown creeper is a winter resident at lower elevations in the region. It nests at higher elevations, such as Roan Mountain on the Tennessee/North Carolina border, during the summer months. The Brown Creeper’s lifestyles rarely finds the bird away from the trunks of trees. If this bird could be persuaded to visit feeders, like birds such as the nuthatches and chickadees, I am sure it would be a welcome guest. For the most part, creepers belong to the fringes of mixed flocks of birds, preferring to forage in a solitary manner. Dennis reported in his book that brown creepers are excellent at gleaning food overlooked by other birds. Suet is the one feeder offering with a good chance of attracting this bird. 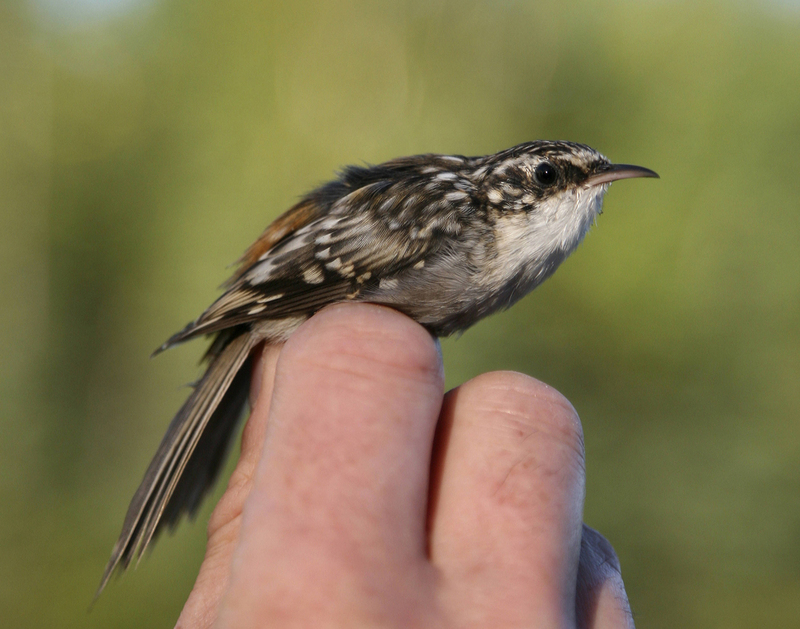 The brown creeper’s shy ways, however, extends to interactions with other birds. Dennis described the creeper as “timid” and “anxious” in the presence of other birds at feeders, which tend to be a boisterous lot. Dennis suggested finely chopped nutmeats and peanut hearts to tempt brown creepers. He also reported an adventurous brown creeper once sampling small pieces of boiled potato. Brown creepers locate their nests behind a peeling piece of bark on a tree trunk. In behavior, this bird acts in a similar fashion to the nuthatches. However, instead of inching its way headfirst down a tree trunk, the brown creeper typically hitches its way up a tree before flying to the base of a nearby tree trunk and repeating the process. Against the bark of a tree, the Brown Creeper is extremely well camouflaged. These small birds are often first detected by sharp-eared individuals capable of discerning its soft, lisping call notes. During the breeding season, this bird also produces a thin, musical warble that serves as its song. Photo by U.S. Fish & Wildlife Service/Donna Dewhurst A hand-held brown creeper is photographed after being banded for a scientific study in Anchorage, Alaska. 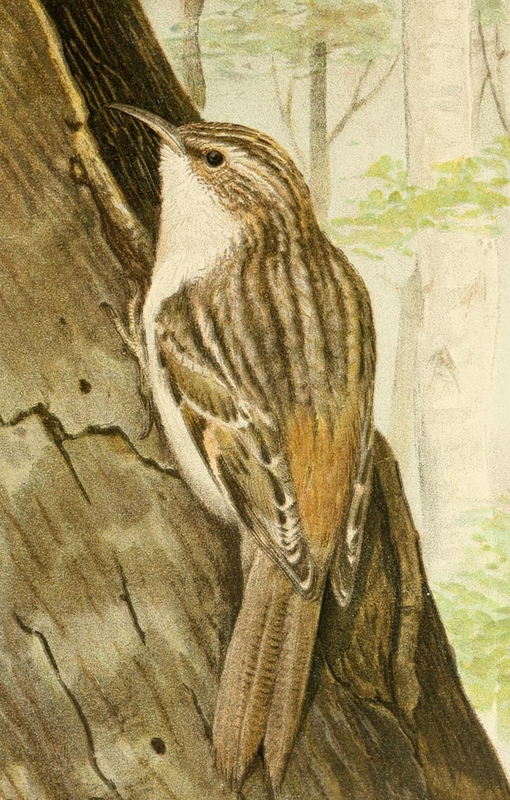 The brown creeper has long, stiff tail feathers to help support itself against the vertical surface of a tree trunk. This is an adaptation that’s also seen in woodpeckers. The creeper also has a curved bill that is an excellent tool for probing for hidden insects, which provide the bulk of its food. It’s scientific name is Certhia americana, which is appropriate since it is the only North American representative of the creeper family. Beyond the New World, eight other creepers reside on the continents of Europe and Asia. The other members of the family include the Eurasian or common treecreeper, as well as short-toed treecreeper, Hodgson’s treecreeper, bar-tailed treecreeper, Sichuan treecreeper, rusty-flanked Treecreeper, Sikkim or brown-throated treecreeper and Hume’s treecreeper. 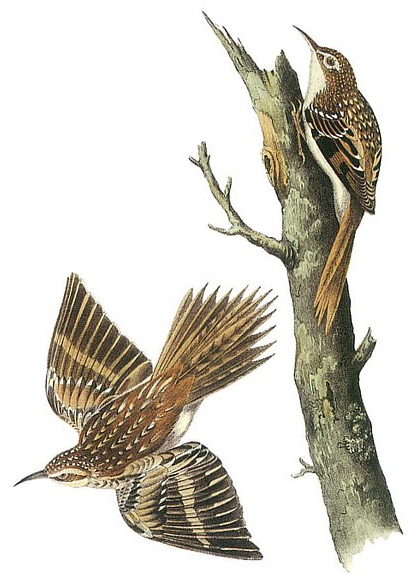 A painting of Brown Creepers by John James Audubon. Although the brown creeper’s range extends the continent of North America from Alaska to Canada’s Atlantic Coast, most people will only notice this bird during the winter months when it ranges as far south as Florida and Texas. The brown creeper will probably never become as neighborly as many of the birds that visit our feeders during the winter months. For its unique status among native birds, however, it’s definitely one worth seeking out. Remember that the next time you think of dismissing that little brown bird you glimpsed out of the corner of your eye. A closer look may bring an unexpected and delightful surprise. This entry was posted in Birding, Birds, Brown Creeper, Certhia americana, Winter birds and tagged Birding, birds, Bristol Herald Courier, Brown Creeper, Bryan Stevens, Carter County Compass, Certhia americana, Elizabethton Star, Erwin Record, Feathered Friends, McDowell News, Northeast Tennessee, Our Fine Feathered Friends, The Erwin Record, Winter birds on November 27, 2016 by Bryan Stevens.